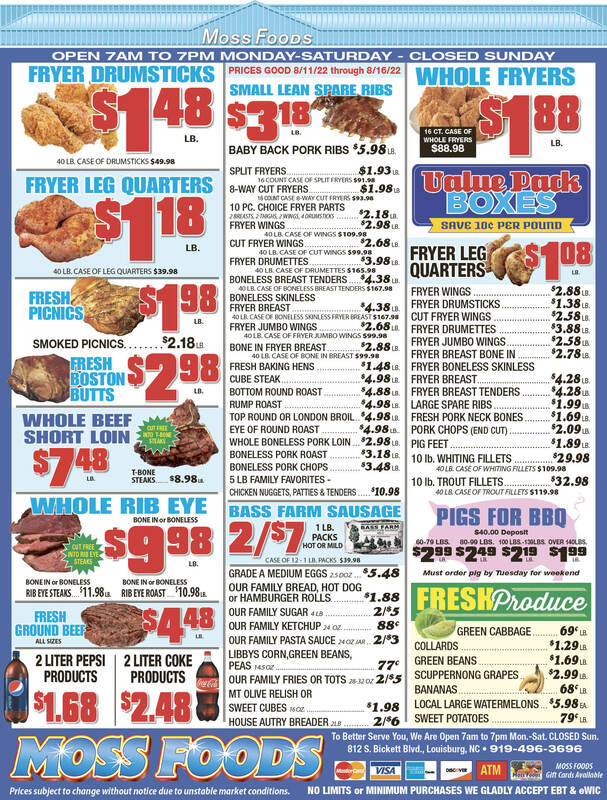 Showing 44 articles from June 11, 2014. The Louisburg Town Council got its first look at a proposed 2014-15 budget Tuesday evening and quickly rolled through the document as they considered raising waste collection fees, hiking electric rates one percent and considering a 2.5 percent pay increase for town employees without much debate -- but a proposed donation to Louisburg College’s Tar River Center for History and Culture slammed the brakes on the progress. HENDERSON — The end of May marked the second graduating class for the Franklin County Early College High School. Still, in many ways, it marked some firsts. 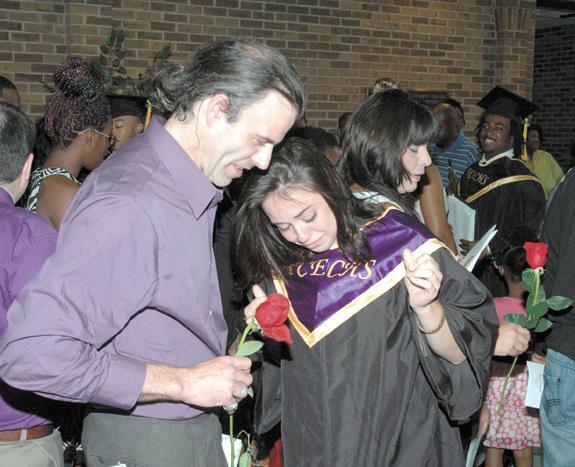 For some of the graduates, they were the first in the family to experience college. On May 30, 10 students walked across the Vance-Granville Community College Civic Center stage, grasping high school diplomas. Students at eight Franklin County schools will get free breakfasts and lunches during the coming school year as part of a new program adopted unanimously by the county Board of Education Monday night. Called the Community Eligibility Provision, the federal program has now been rolled out in all 50 states after being tested in a few the last several years. A school is eligible for the program if 62.5 percent of its students qualify for free and reduced price lunches. LOUISBURG — Information about a proposed natural gas pipeline through Franklin County is as hard to detect as the colorless gas itself. Duke Energy and Piedmont Natural Gas have proposed running a natural gas pipeline south through North Carolina. One of the project bidders, Spectra Energy in Houston, has a preliminary plan that shows running the line through the heart Franklin County. Americans just love a juicy, unprovable conspiracy, so let’s get another one going. Maybe the Common Core Curriculum would be a great place to start. As you’ve read, it’s being demolished by our leaders in Raleigh and the question is why? Common Core has been the target of the far right for months and it has been the topic of so many provably wrong charges and allegations, no one seems to remember what it’s really about. Please, please, PL-E-E-Z-E, let’s not call it Ditchgate. Although from the way this project has started out, you may be tempted to cast a cynical eye on developments thus far. It appears that Piedmont Natural Gas has joined forces with Duke Energy in an effort to build a natural gas pipeline across Franklin County from north to south. It’s getting close to budget crunch time. 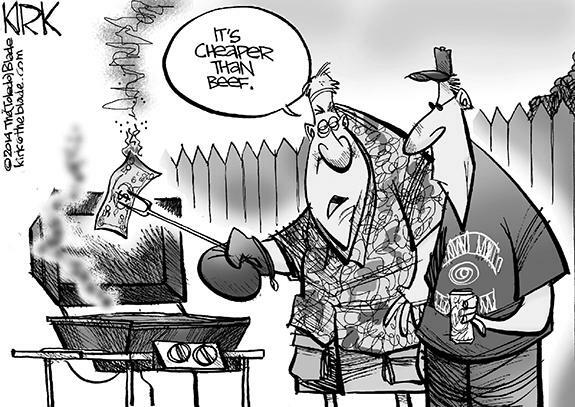 While some spending plans are creating quite the hoopla (see Page 1A as an example), there are some spending plans, such as the one in the town of Bunn — where the tax and utility rates stayed the same — that didn’t rate any response, at all. This week I turn my attention to a scandal that impacts many locally, the Veterans Administration and the death of veterans that fought and lost their battle to obtain earned benefits. It is an old story of broken promises, and one that continues to repeat itself. 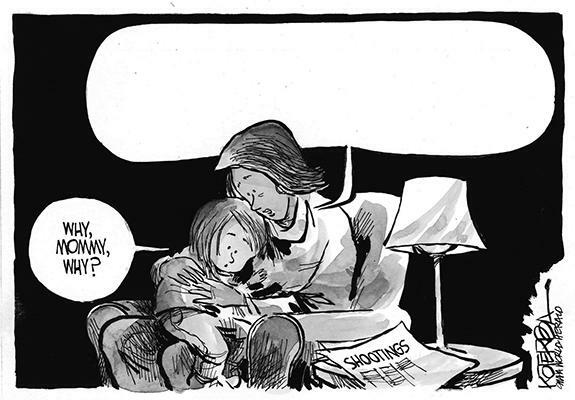 I remember my mother telling me of her father, a veteran who had returned from WWI. The troops were promised a bonus for their service. One thing that is certain to come out of the General Assembly’s short session is legislation offering public school teachers a raise. It is not because the Republicans in the General Assembly care about them or public education; it is because they need a talking point. Is public education a ‘right? My wife Carolyn and I attended the “Moral Monday” rally in Raleigh Monday evening, June 9, which focused on public education. Many at the rally, including ourselves, wore red to show our support for our teachers. Many were teachers and educators themselves. LOUISBURG - Funeral services for Charlotte Burt Alston, 80, who died Sunday, June 8, 2014, will be held at 2 p.m. Saturday, June 14, at Perry’s Missionary Baptist Church, with the Rev. Randolph Alston officiating. Burial will follow in the church cemetery. LEAP TO GREATNESS. 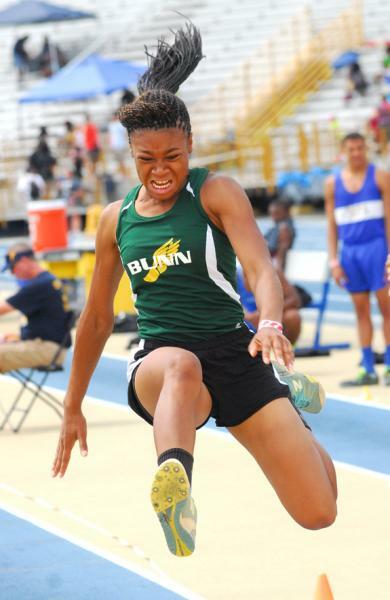 Bunn junior Tainasha Vines won the long jump and triple jump at the Class 2-A State Track and Field Championships in May. FRANKLIN COUNTY -- Trent Sanders has seen his share of high-profile track and field athletes in the Northern Carolina Conference during his storied stint as the Franklinton High School head coach. But this season might have topped Sanders’ all-time list as NCC standouts teamed up for six titles at the Class 2-A State Track and Field Championships last month in Greensboro. 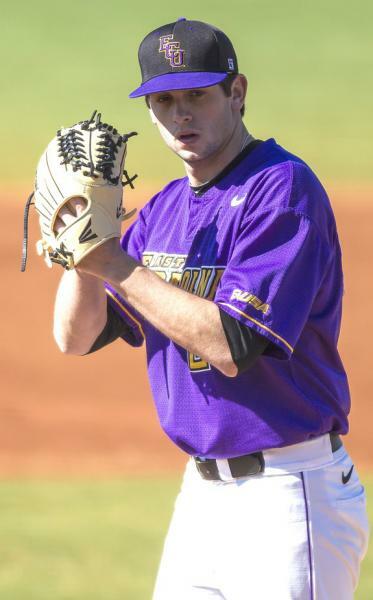 LOUISBURG -- Even when he was a youngster starring for the Louisburg All-Stars, there was a feeling that Tyler Bolton might someday develop into a high-level baseball player. Bolton has lived up to that promise and more, and now he is about to begin his professional career with the Arizona Diamondbacks’ organization. THE TOP OF THE PODIUM. 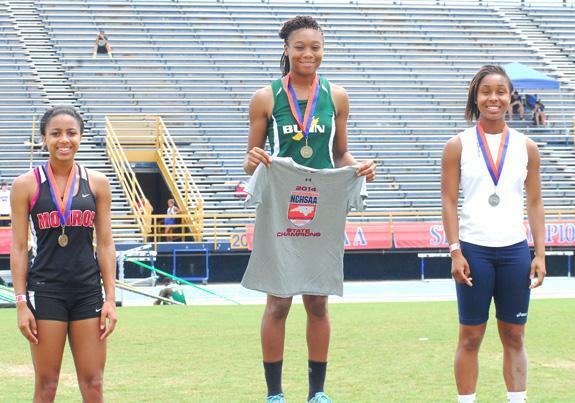 Bunn High School junior standout Tainasha Vines was the winner of both the long jump and triple jump at the Class 2-A State Track and Field Championships, which were held in May. LOUISBURG -- For the first time in history, each of Franklin County’s high schools boasted an individual title winner at the North Carolina State Track and Field Championships. That is certainly a cause for celebration -- and that’s exactly what happened during Monday’s meeting of the Franklin County School Board. TAKING OFFENSE. Veteran Maurice Person picked up the Offensive Award this season for the Louisburg High School diamond squad. LOUISBURG -- It was a memorable season for the Louisburg High School baseball squad, which shared the Tar-Roanoke Athletic Conference championship and reached the third round of the Class 1-A State Playoffs. Six Warriors earned All-TRAC honors, led by pitcher Casey Gupton, who was the runner-up for the league Most Valuable Player. FRANKLINTON -- Already saluted as the top players in the Northern Carolina Conference, Franklinton’s Hannah Rayman and Anna Moss added another accomplishment to cap off their 2014 girls soccer campaign. 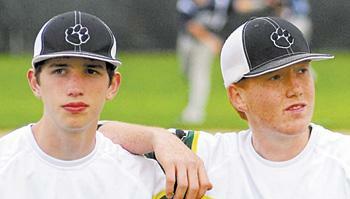 Rayman had already been selected as the NCC Player of the Year, while Moss was the pick as the NCC Keeper of the Year. ROCKY MOUNT -- Jay Koloseus has a well-earned reputation as a high-level distance runner. But he hasn’t had to trek too far to sign a pair of competitors for his fledgling cross country program at Louisburg College. Koloseus, who ran in college at Syracuse University, is overseeing the new running opportunity at Louisburg -- and two Nash Central High School standouts have signed letters-of-intent to work under Koloseus. LOUISBURG -- Louisburg College’s much-anticipated women’s soccer season will begin with a tournament appearance in Wilmington on Aug. 23-24. LC will open the round-robin event on Aug. 23 with a meeting against traditional powerhouse Howard Community College. CLOUT CARRIER. Bunn High School’s Spencer Brickhouse is expected to be a high-level offensive performer at the Powerade North Carolina State Baseball Games. BUNN -- Three years and counting -- that’s the number of consecutive seasons that a Bunn High School standout has been selected to the Region 3 Team for the upcoming Powerade North Carolina State Games. Bunn’s Christian Sledge participated in the event in 2012 and 13, but had since aged out after graduation. 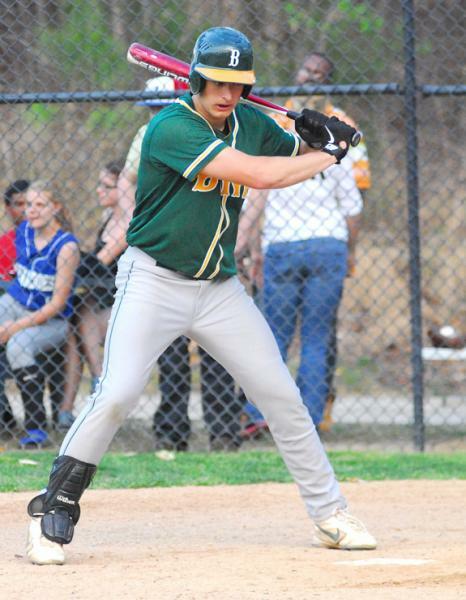 Taking his place this summer will be BHS sophomore Spencer Brickhouse, who is coming off a star-studded season that featured an amazing .548 batting average. RALEIGH -- Doug Warf, Vice President of Marketing for the National Hockey League’s Carolina Hurricanes and Executive Director of the Kids ‘N Community Foundation, has announced that registration is now open for the 16th Annual Kids ‘N Community Golf Tournament. The 2014 tournament will take place at the challenging Prestonwood Country Club in Cary on Sept. 22. 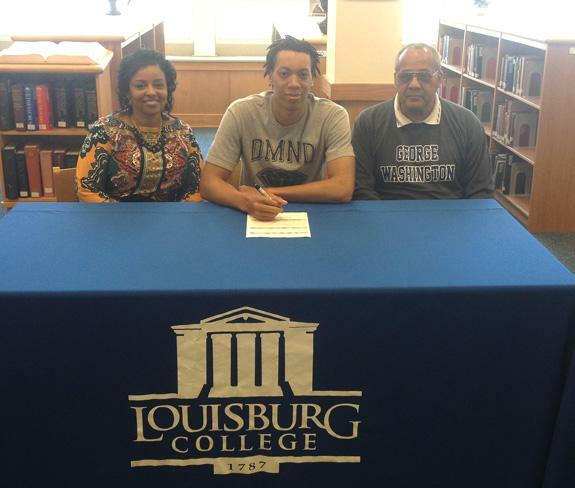 LOUISBURG -- After his team saw its four-year national tournament run come to an end this spring, Louisburg College men’s basketball coach Mark Vanderslice vowed to respond in the form of his best-ever recruiting class. Bunn’s Deshawn High is the most notable local name in the impressive group, which features five newcomers to date -- and more expected on the way soon. FRANKLIN COUNTY -- The Southern Franklin Youth Football Association will begin a gridiron program this fall as the Franklin County Chargers. Players and cheerleaders ages 12-under are welcome to participate. 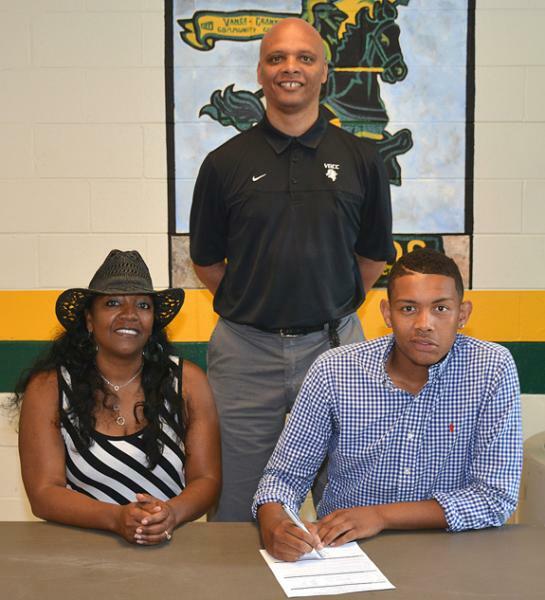 HENDERSON -- Jonathan I. Debnam of Fuquay-Varina recently signed a letter of intent to join the men’s basketball team at Vance-Granville Community College next season. 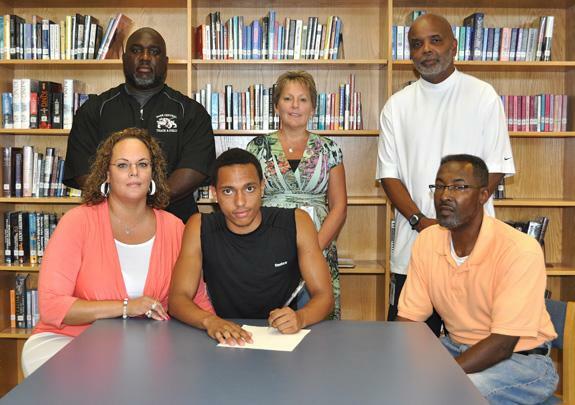 Debnam (6’5”) graduated on June 6 from Fuquay-Varina High School in Wake County. A starter on the FVHS Bengals basketball team, at various times he played the positions of power forward and center. 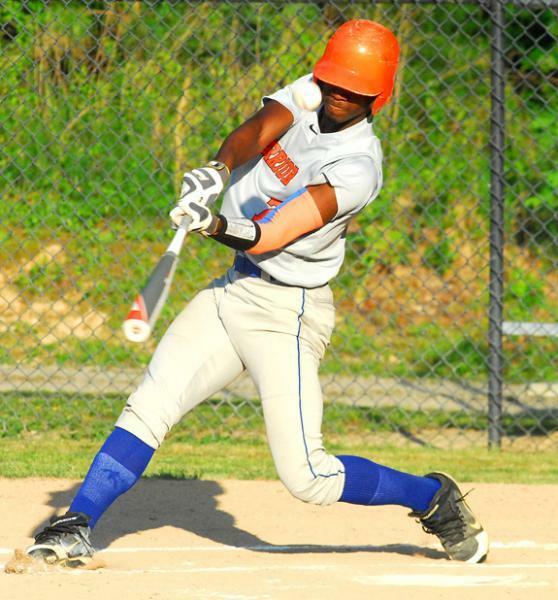 LOUISBURG -- Louisburg College baseball player Cedric Mullins has added to his long list of awards for 2014 as he now adds a 2014 NJCAA All-American honor to the list. The All-Am nod tops off a year where he was also the Region X Player of the Year and Louisburg College Male Student-Athlete of the Year. ZEBULON -- Carolina got another strong start from Michael Peoples and the offense collected 13 hits in a 6-4 win over the Potomac Nationals on Tuesday night in a Class A Carolina League baseball event at Five County Stadium. The Mudcats (28-35) broke a three-game losing streak and handed the Nationals (35-29) their second loss in three games. 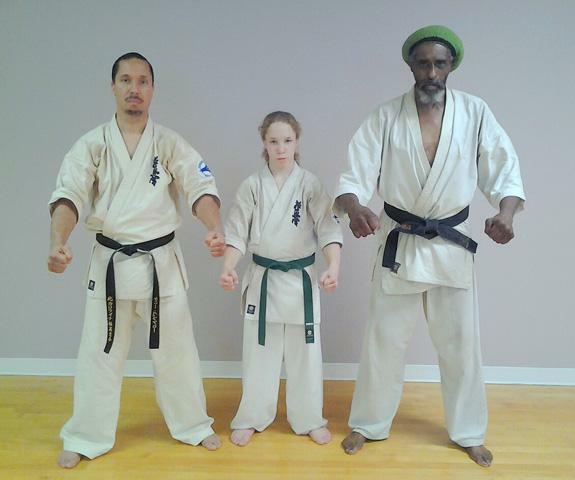 WARREN COUNTY -- Famous Kyokushin Karate World Champion Fighter and film star Willie Williams recently trained local Kyokushin Karate youth champion/competitor Christian Buffaloe in professional fighting techniques and strategies  that he used to rise to the top of the martial arts world in the 1980’s. Willie Williams agreed to train Christian Buffaloe as a favor to Christian’s Father/Instructor Kenny Buffaloe, a Warren County resident. 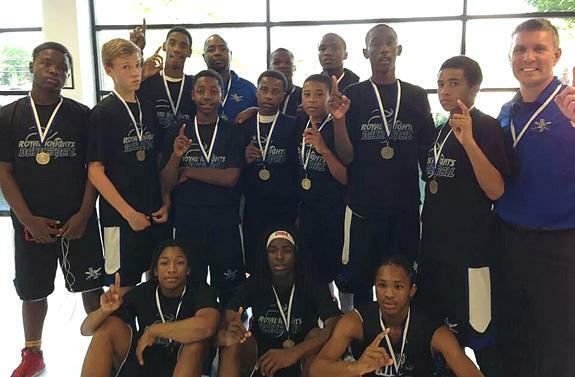 The Franklin County Royal Knights 8th-Grade Basketball Team won the championship last weekend at the Hoop City U Finale -- despite competing in the 9th-Grade Division. 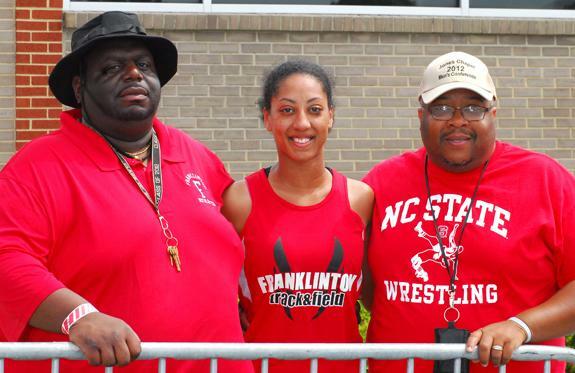 Franklinton High School senior Charity Snelling (center) poses with coaches Trent Sanders (left) and Clennie Wilkins (right) after winning the Girls High Jump event at the Class 2-A State Track and Field Championships last month. Sanders has been saluted as the Northern Carolina Conference Boys Coach of the Year. 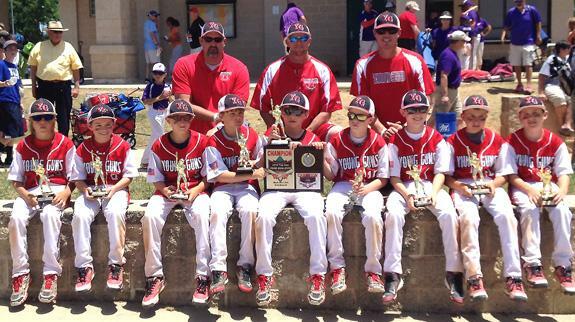 The Franklin County Young Guns Travel Baseball Team went 3-1 last weekend and won the championship at the Rocky Mount Top Gun Zone Qualifier Tournament. Pictured are (back, l to r) Coaches Wilson Mize, Jamie Wilson and John Canaday; (front, l to r) Alex Douglas, Gavin Johnson, Nick Moran, Landon Mize, Fisher Canaday, Trenton Wilson, Parker Southall, Kyle Herrmann and Brandon Moran. Not pictured is Eli Sharpe. 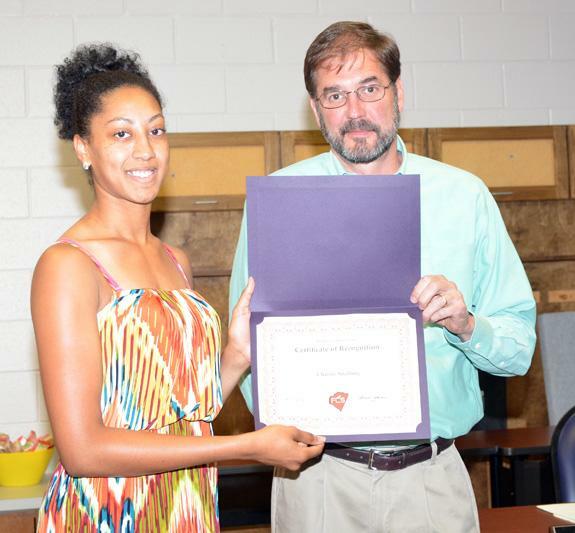 Franklinton High School’s Charity Snelling receives a certificate of recognition to commemorate her high jump crown at the Class 2-A State Track and Field Championships. Presenting the award is Gil Johnson, the Chairman of the Franklin County Board of Education. Coker, a senior, will continue her track and field career at Coker University, which is located in South Carolina. Lunch Buddies is an awesome program organized by the ladies at Louisburg United Methodist Church. Adult volunteers meet with third-grade students from Louisburg Elementary School during lunch for a time together. This encounter happens once a month when the children get to eat with their Lunch Buddy, get involved in interesting conversations, and develop a wonderful, special, and valuable relationship with their adult buddy. Richard B. Gill III of Franklinton announces the upcoming marriage of his daughter, Priscilla Caroline Gill, to James Frank Miller Jr. of Moyock. 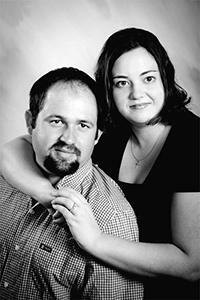 The groom-elect is the son of James and Linda Miller of Moyock. The bride-elect is also the daughter of the late Deborah May Gill. A Sept. 27, 2014 wedding is planned at Flat Rock Baptist Church, Louisburg, at 2 p.m. All friends and family are invited to attend. 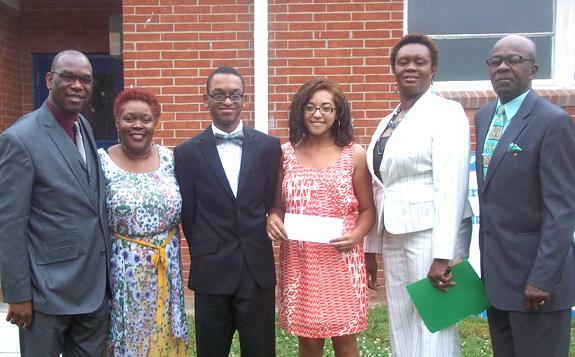 Telephone: 496-1131 • Meals Daily: 11:30 a.m.
An historic alumni association presented its annual scholarship to a Louisburg High student. Perry’s School Alumni Association presents a $500 scholarship annually to a deserving student who is a descendent of someone who attended the former Perry’s High School of Centerville. This year’s recipient is Jada Richardson-Small, the daughter of Paula Richardson and James Derrick Small and also the granddaughter of Mr. and Mrs. Ollie Richardson. LOUISBURG — The Franklin County Health Department is shutting down its dental clinic. Department leaders said the clinic was losing customers and revenue, making the June 30 closure a necessity. “It’s just a culmination of things coming together, from the budget and the physical plant,” Health Department Director Dr. Chris Szwagiel said of the decision to shutter the clinic at the end of the fiscal year. Air Force Airman Colin J. Heimann graduated from basic military training at Joint Base San Antonio-Lackland, San Antonio, Texas. YOUNGSVILLE — Town commissioners already meet nights. Now, they’re giving a weekend a shot. The board is set to conduct a work session on Saturday, giving them a chance to discuss town business without all of the formality of a regular board meeting. “This session,” said Commissioner Cat Redd, who floated the idea for a Saturday meeting, “is designed to allow the mayor and commissioners to openly discuss ideas and issues outside of the monthly meetings. YOUNGSVILLE — Sheriff’s deputies are investigating a shooting death. According to reports, deputies responded to a vehicle parked outside a home on Bridges Drive off Moores Pond Road the evening of June 6 to find a 17-year-old suffering from a gunshot wound. The teen, Ian Richardson, was taken to WakeMed where he died as a result of his injuries the following day. A Franklinton area man who called deputies to get a woman evicted from his house wound up arrested on drug charges. Cephus E. Dunston Jr., 66, was charged with possession of marijuana, maintaining a dwelling for the sale of a controlled substance and resisting a public officer. According to a report by Dep. A. Andrews Jr., Dunston called the sheriff’s office the evening of May 30 to have his girlfriend removed from the residence. A Louisburg area woman is slated to appear in court later this month on charges that she stabbed a boyfriend and threw a hammer at him. Holly Batie, 27, was charged with assault with a deadly weapon with intent to kill inflicting serious injury, and injury to personal property. LOUISBURG — Franklin County’s police chiefs have joined forces. Earlier this spring, each of the towns’ departments aligned themselves with the Lake Royale Police Department and the Louisburg College Police Department to form the Franklin County Association of Chiefs of Police (FCACP). The designation formalizes a working relationship the departments have shared since 2005.